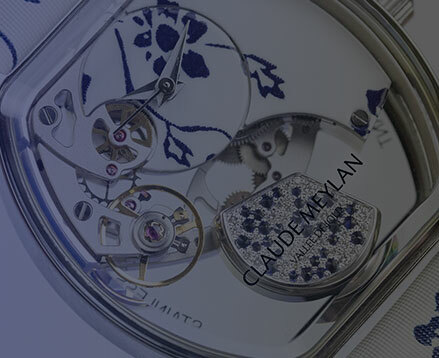 CLAUDE MEYLAN takes inspiration from spring and grace to introduce TORTUE in a strong and meaningful harmony. TORTUE PETITE FLEUR associates blue and white with a new sculpture of Time. The all new movement 7.75CM17 caliber demonstrates innovation right across the board. The dial is positioned at 12 O’clock to make space and allow the moving escapement to evolve above the gear train. At 3 O’clock, the decorating bridge enhances the dial decoration and effects. These new positions give way to the frontal moving rotor at 6 O’clock. It mirrors the dial and is set with diamonds and “reversed” sapphirs. Rotating freely and in harmony with your wrist movements, the rotor provides a unique animation to TORTUE PETITE FLEUR. The dial, the bridge at 3 o’clock, the bracelet and up to the presentation box are fully printing by a new imported technology to offer a very specific harmony. They contribute to create transparency enhanced by the powerful association of white and blue..
TORTUE PETITE FLEUR invites you to travel into a new dimension where time and space are solely translated by your own imagination.